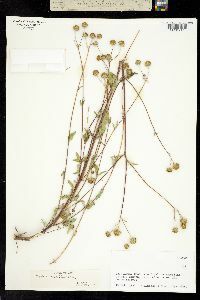 Perennials, 100-200 cm. Leaves opposite (proximal) or alternate (distal); petioles 10-55 mm; blades ovate or rhombic-ovate to lance-ovate or lanceolate, 3.5-12.5 × 1-8 cm, margins serrate or serrulate, faces strigose. Heads usually 3-9+ in ± corymbiform arrays. Peduncles 3-14 cm. Involucres 11-18 × 7-10 mm. Phyllary apices abruptly narrowed to acuminate or spatulate (phyllary bases broad, indurate, apices herbaceous). Paleae 6.5 mm, apices prominently cuspidate. Ray florets 10-14; tubes 1 mm, laminae 7-15 mm. Disc florets 50+; corollas 3-4 mm (staminal filaments hairy). Cypselae 3.5-3.8 mm, ± strigose; pappi of 2 lacerate, aristate scales 2.2-2.8 mm plus 2-4 lacerate scales 0.5-0.7 mm. 2n = 34. Flowering Jun-Oct. Dry slopes and canyons, fields, roadside ditches; 100-2300 m; Ariz., N.Mex., Tex. ; Mexico; West Indies (Cuba); Central America. Viguiera dentata is widespread and variable. It is unique in Helianthinae in the hairy staminal filaments. 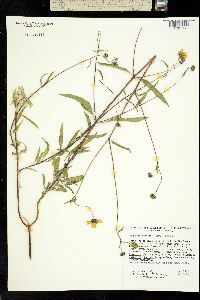 The name V. dentata var. lancifolia S. F. Blake has been used for plants from Mexico.